Does math bug you? The problem is, you must use math in this technical HVAC world. No matter what part of the HVAC industry you are in, this book will painlessly give you all the math you need to know. I don’t tell you how an equation is derived or how pi was developed—I just show you how to use them in the real HVAC world. Changing a decimal to a fraction like 10/13 is of no use to you. I show you how to change any decimal into the fractions you measure with. This is a book for math dummies—written by a former math dummy. You will enjoy learning only the things you need to know. If you found math difficult, we make it easy. Only the math you need on the job. Practical applications to HVAC for measurement, fractions and decimals, squares, cubes and roots, ratio and proportion, area, volume, angles, and triangles. 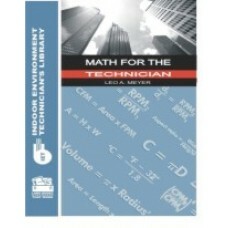 Math for the Technician is the best math book for the technician yet. The math is directly applied to equations technicians actually can use. One of the best ways to learn the math necessary in our industry is by applying it to the problems we need to solve on the job. Mr. Meyer has done exactly that!